This store bought costume for boys entered our 2015 Halloween Costume Contest. 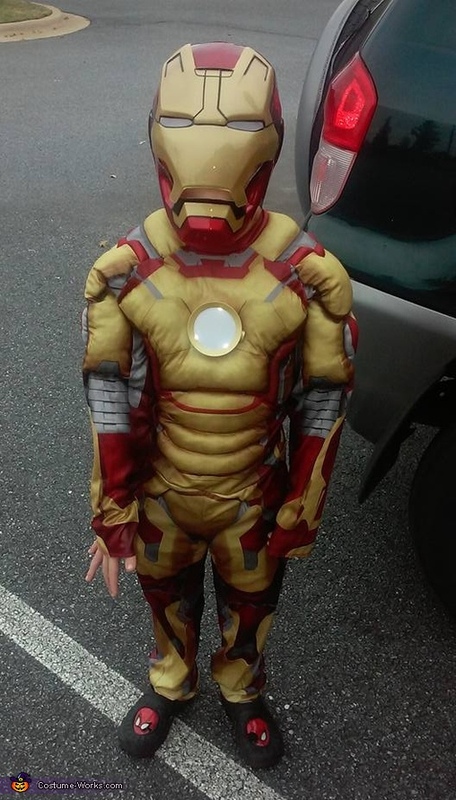 This is a photo of my son Grayson wearing Iron Man. We did not make this costume, it was bought from a Halloween store. My son Grayson is 5 years old. He is wearing his Halloween costume for 2015. To go along with his costume, I made a trick or treat bag. I have made trick or treat bags for him every year that go along with his costume. Last year he was Captain America which I made the shield and it lights up. The year before that, he was Batman which I made a bag where there were 3D buildings and I made the Bat symbol coming from one of the buildings. I spend a month coming up with ideas on how to make the bags and a month to actually create it. This year, I decided since he had the Iron Man reactor already in the costume which lights up, I thought I would do the Avengers A and light it up. I made the 3D effect using Hug drink straws. It definitely is not easy making these bags every year because I do my best to go bigger and better each time. It can be challenging, but I love doing it because I feel like he stands out among the rest. Not only does he stand out to me, but also it keeps him safe while trick or treating. While trick or treating, a tip is to always have some type of light for safety reasons, so I always keep that in mind as I am making these bags for him.